Have a look at the latest creations from NDGRags brought to you by Zazzle.com. Edgy and original, each design is carefully crafted to suit those with a taste for the unique and enigmatic. but also the realms of fantasy, the supernatural and the imagery of the collective unconscious that informs and inspires us all. Have a browse, if you dare, and don’t forget to tell your friends about the NDGRags emporium. Oh, and if they ask, just tell them the Squid King sent you. 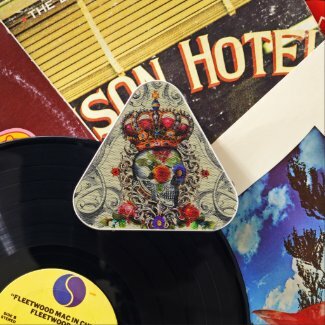 One-of-a-kind vintage inspired squid design on a genuine Zippo® lighter. A unique vintage inspired pocket lighter – customizable with your initial. Available in your choice of four finishes, these quality lighters are windproof, durable, and come with a lifetime guarantee. Made in the USA! Zippo® Lighters are an undeniably high-quality gift for anyone that appreciates a true American Classic. Posted by ndgrags on January 12, 2019 in Merch Teaser, Uncategorized and tagged lighter, squid lighter, squid zippo lighter, unique gifts, vintage squid, vintage squid lighter, vintage zippo lighter, zippo lighter. Day of the Dead 2.0 – Available in Leggings, Yoga Leggings, Capri and Yoga Capri styles. Go from Yoga to dinner in these unique body-hugging leggings. this hard-working vibrant fabric won’t lose its shape or fade. These leggings are opaque and ideal for working out. Posted by ndgrags on July 13, 2017 in Merch Teaser, Uncategorized, Wearables and tagged bohemian fashion leggings, boho fashion, calaveras leggings, day of the dead, day of the dead leggings, day of the dead yoga pants, floral skull art, floral skull fashion, memento mori, Mexican art, skull and floral leggings, sugar skull leggings. Our “Memento” Pillow is never leaving Las Vegas, and we just couldn’t be more proud. One of our favourite customers in Las Vegas sent this photo of her new “Memento” Pillow by NDGRags on Zazzle. This bedroom is such a gorgeous example of a seriously eclectic and funky-elegant aesthetic we just had to feature it. A superb mix of texture, form and vibrant colour. Very lovely. The atelier is thrilled to see the fruits of our labour out there in the world. Today Las Vegas – tomorrow? “Memento” Pillow by NDGRags on Zazzle – Available in a selection of size and fabric options. Fun for the whole family…Carpe Diem. Posted by ndgrags on July 13, 2017 in Quite Proud of Ourselves and tagged bright floral sugar skull, day of the dead, floral skull pillow, goth design, memento mori art, skull pillow, sull and roses pillow, tattoo inspired decor. Hey – enormous sad clown! Mere words fail to express our profound gratitude. Posted by ndgrags on April 6, 2017 in Uncategorized, Wildcard and tagged 7 foot clown, Folsom Prison Blues, Pinball Wizard, Puddles Pity Party, Puddles the Clown, sad clown, sad clown with the golden voice. Posted by ndgrags on November 21, 2016 in Wearables, Wildcard and tagged courage, cowboy, indian, indian head, Indian head test pattern watch, Indian head watch, native american, native american art, old west watch, strength, vintage old west watch, vintage TV test pattern. Unique and sleek custom “Squid” Design! Each pair of custom High Top ZIPZ® is designed so that any ZIPZ® top can be matched with a sole of the corresponding size, so you can change your style as often as you’d like to match any mood, occasion, or outfit. A fresh look at sneakers, ZIPZ® shoes are a one-of-a-kind way to express yourself! Posted by ndgrags on November 12, 2016 in Uncategorized and tagged black and white squid high tops, high tops, octopus, octopus design high tops, octopus design shoes, squid, squid design shoes, squid high tops, squid hightops, squid running shoes, squid sneakers, tentacle design shoes, tentacle high tops, tentacles. Posted by ndgrags on November 7, 2016 in Wildcard. A speaker that looks as beautiful as it sounds. Dimensions: 4.8″ x 4.4″ x 1″; Weight: 0.4 lbs. Full stereo sound with Bluetooth functionality. Built in microphone to make phone calls. SNR (Signal to Noise Ratio): >70dB. On-speaker play/pause and change song buttons. 10 hour battery life with mini USB charging slot (cord included). Compatible with any device that has Bluetooth connectivity. Also included is a 3.5mm audio cord for devices that don’t have the option of Bluetooth. Designs printed in full color with UV technology on both sides. Posted by ndgrags on May 26, 2016 in Uncategorized and tagged Bluetooth+speaker, crown skull rose speaker, crown skull speaker, crowned floral skull speaker, crowned skull speaker, Pieladium portable Bluetooth speaker, Pieladium+speaker+skull, roses and skull, skull, skull and rose speaker, vintage, vintage skull and rose. 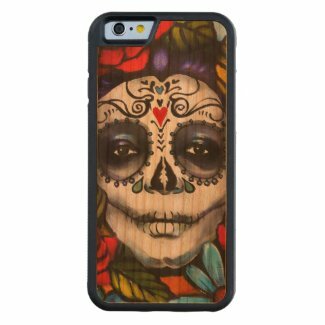 Vibrant floral Day of the Dead image on a lovely wooden case. customizable in your choice of light, medium or dark wood grain. Individually handmade using domestically and sustainably harvested natural wood. This beautifully crafted case by Carved® combines real wood with a full wrap flexible bumper rim for added protection. Handmade in the USA. Proudly printed in Elkhart, Indiana. Posted by ndgrags on May 20, 2016 in Electronics Accessories and tagged bright floral sugar skull, calavera, day of the dead, floral skull, memento mori, memento+mori, roses and skull, skull, skull flowers, skull makeup and roses, sugar skull. Something new in the NDGRags Collection! A crowned skull with floral embellishments on a beautiful commuter bag. Customizable from top to bottom, in your choice of background color and trim. A very unique bag, for a very unique individual…What more could you ask? 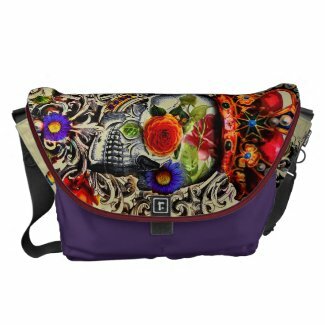 Posted by ndgrags on November 15, 2015 in Electronics Accessories, Messenger Bags, Wearables and tagged carpe diem, commuter bag, courage, crown, crown skull, floral, floral skull, goth design, gothic, gothic bag, gothic design, memento mori, Messenger Bag, rose, rose crown skull, skull, vintage.